All transactions are safe and secure with a reliable history in online purchasing behind each of our associates. Buy the Spider-Man Costume Hoodie t-shirt to own Spider-Man clothing and merchandise. This Spider-Man costume hoodie is the ideal piece of clothing to wear over one of your Marvel Spider-Man t-shirts on a chilly day. It's an easy but highly effective disguise for fans of Spidey who are looking for slightly warmer clothing. 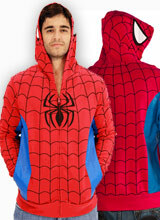 The costume sweatshirt is designed to look like the Spider-Man costume created by Peter Parker. The hood displays part of the head of his mask, with two white spider-like eyes. Become the Amazing Spider-Man in this Marvel Comics Spider-Man hoodie that will complement your favorite tee. Wear this piece of Spidey apparel for a day spent web slinging. In addition to the Spider-Man Costume Hoodie tee above, browse the Spider-Man Clothing Gallery for more apparel like men's and women's clothes, kids shirts or hoodies.